Shredded matter refers to one of many end times theories that relates to the expansion of the universe. That is, theories that arise out of the scientific view. This expansion, after a period of slowing down a number of billion years ago, has been accelerating. “Everything” is moving further and further away from other things, planets, galaxies etc. at a faster speed, and that eventually, if there is no check on this, every atom will end up being an infinite distance from every other atom! End times theories are referred to as eschatology. These have been with us for millennia, and continue today. Mainly religious in the past; return of a messiah, Armageddon, etc. An Hasidim in Brooklyn expect the Rebe to rise from his grave and return! Talk about zombies! One more sign of the zaniness of religion. Marxism has also been referred to as an eschatology theory: with the end of class conflict, history will be over! What a relief that would/will be! Anyway, I’m more interested in the physicists view of the end of the universe, as well as the beginning, and everything in between. 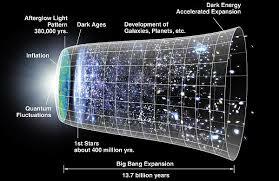 It’s been called Big History which the image attached purports to show: inflation (the big bang), a period of pure plasmic energy, out of anomalies in this energetic ether matter arose, then Life (matter replicating itself), then self aware life and Culture. The latter some say is composed of Memes, the only other replicator after DNA. Also I am interested in the eschatology of empire, the end times of the U.S. empire which is clearly in decline along with what many believe is the approaching and inevitable end of capitalism as well. I did not “serve” in Vietnam, but lucked out with a lottery number that meant I would not be drafted. I believe I have suffered from PTSD nonetheless due to the realization at the time that my country wanted me to go and kill civilians, children and other non combatants, to help napalm people, defoliate indiscriminately, in short to be what today we understand as a terrorist. Last but not least, is the end times of the benevolent climate we have been gifted with on planet earth for millennia. As I write this, Earth Day is tomorrow and there will be a rally in Tompkins Square Park to call for a ban on fracking, a ban on a large natural gas pipeline on the west side, and a call for renewable energy resources. If we listen to scientists, it’s already too late to avoid calamitous climate change. Thanks for doing your part to keep the aroma closer together. Thanks! Never thought of it that way. And I think your’e the first to ever post a comment on my website. I’m adding something this evening to the site, recently sold a piece, and looking to upgrade the site. stay tuned!